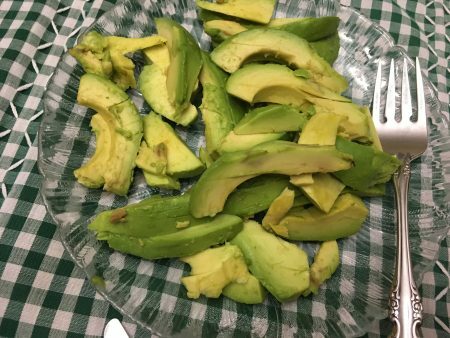 this may be a blog-worthy recipe, give it a try! Today as I was sorting through the pile I came across the Warm Taco Slaw recipe given to me in March by my friend Kelly. 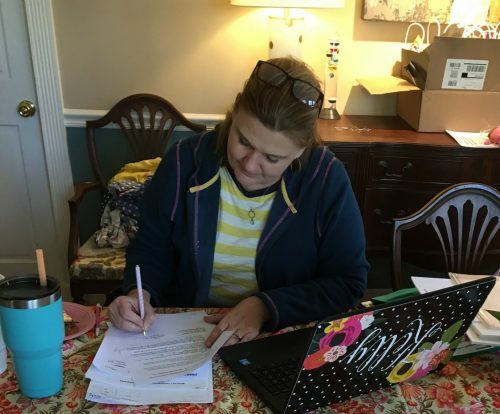 Kelly and I had some Community Bible Study work to do together and so we spread out on her dining room table and got busy. Before long we were talking food. 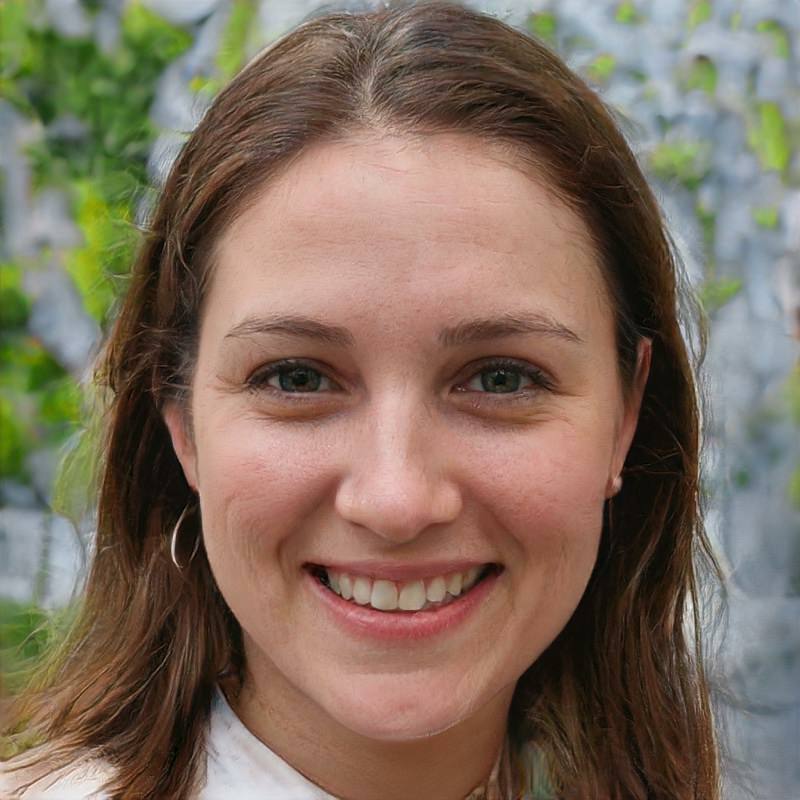 Kelly loves to cook and has a growing family to feed. She is health conscious and totally excited about the Warm Taco Slaw she made for our lunch. Oh, my goodness, one bite and I knew what the excitement is all about. 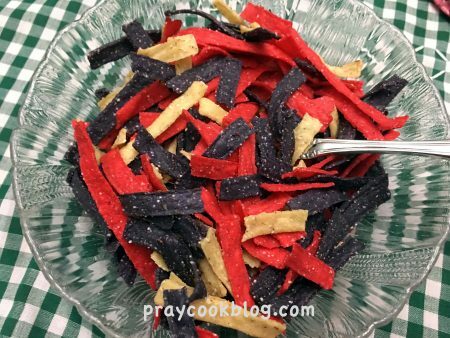 Today, I pulled the recipe out of my loved it-blog it pile! 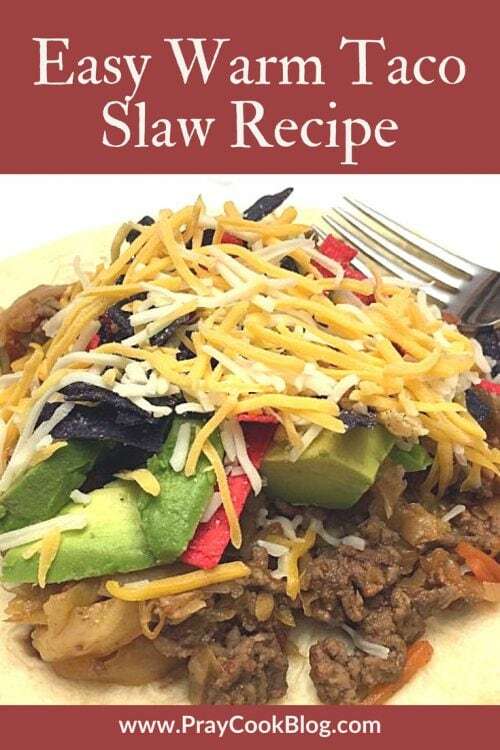 The first time Kelly saw a warm taco slaw recipe was in the Craveable KETO Cookbook by Kyndra D. Holley. She goes on to include a Mexican seasoning blend recipe in the book. For convenience, we adapted it to fit our own needs by using a store-bought package of taco seasoning. 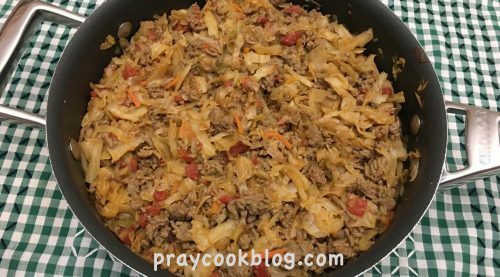 The two main ingredients are ground beef and cabbage. Added ease comes with this tasty main dish because the recipe calls for a 16-ounce bag of coleslaw mix. Easy-peasy! The second time I made it (these pictures) I cut up a head of cabbage because that is what I had on hand. Either one works fine. When I used the head of cabbage I ended up using more than 16-ounces of cabbage which was no problem. We adore cabbage! 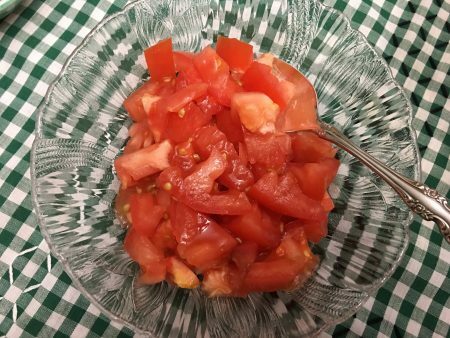 Some of the heat in the recipe comes from diced tomatoes and green chilies. 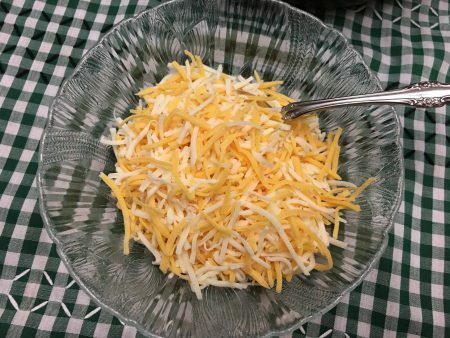 I used Ro*Tel and it wasn’t too mild or too hot! It was JUST right! Serving to my Chief Taco-eater Husband and Sous-chef dish-washing mom, I warmed up a few flour tortillas and layered the warm taco slaw with freshly sliced avocado, juicy diced tomatoes, a dollop of sour cream, crispy tortilla strips and a sprinkle of fiesta cheese. 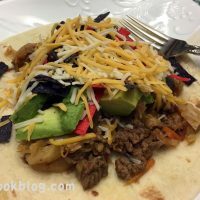 This is a fun recipe because you can spice it up nice and hot with additional diced jalapenos, or keep it simple and mild, however you like it! Add some chopped cilantro or flat-leaf parsley for even more flavor. The first time I made a warm taco slaw I served it with a small green salad but the next time we all agreed that it is a meal in itself! For a summer lunch or supper, this will keep your kitchen cool while still warming up your appetites and your taste buds. 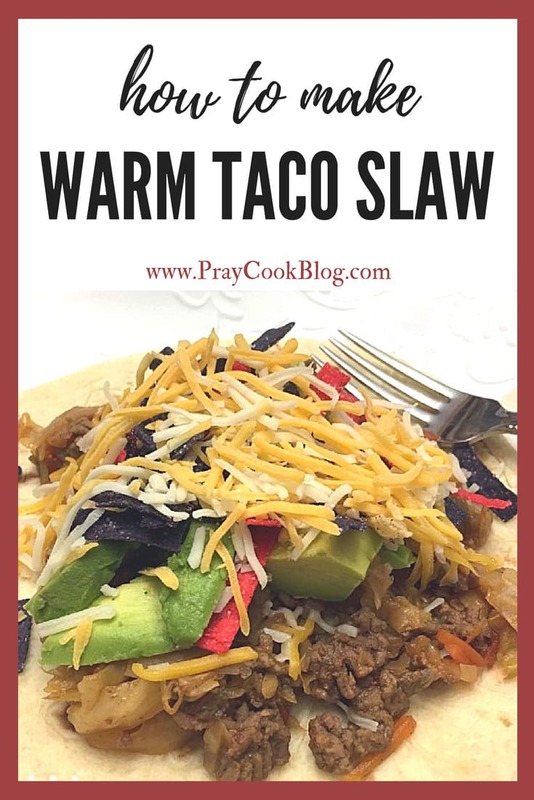 Warm Taco Slaw is on the menu for supper tomorrow! Whether you make it mild or make it hot your taste buds will thank you for this fantastic fun lunch or supper recipe! Cook ground beef in a large skillet over medium heat. Cook about 15 minutes until the meat is browned and cooked through. Drain off grease. Add taco seasoning packet, can of diced tomatoes and green chilies, coleslaw mix or cabbage. Continue to cook over medium heat until the cabbage is tender, about 7 minutes. Add black olives. Salt and pepper to taste. Place on warmed flour or corn tortilla or forgo the tortillas and spoon directly on the plate. Top with sour cream and desired garnishes. Enjoy! Garnish according to your favorite taco toppings! 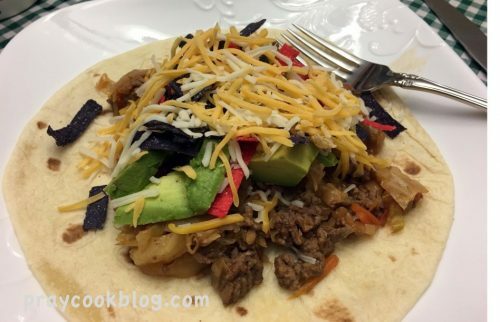 Delicious wrapped in a tortilla or served alone with toppings. Usse your imagination and taste preferences!